Here's a simple way to understand the online travel leader. One of the few survivors of the dot-com bubble, Priceline Group Inc (NASDAQ:BKNG) has gone on to reward investors immensely since that market crashed. In the last ten years, the stock is up more than 4,000%. The company has benefited from the online travel industry's seemingly endless growth; growing primarily through acquisitions. Above all, Booking.com is the biggest reason for Priceline's success, generating the majority of its revenue today. Because of those acquisitions and the growth of its namesake property, Priceline has delivered consistently strong revenue growth over the years. Though the headline figure dropped to 7% in its most recent quarter, that was largely due to the stronger dollar. In constant currency, Priceline's revenue grew 22% in the most recent quarter. Currency exchange rates have an outsized effect on the company's figures, as it derives 88% of its revenue from abroad. However, analysts expect revenue to increase 15% in 2016 with the help of normalized exchange rates. Fading growth in the U.S.
Priceline's international business has been growing rapidly, but the U.S. business has started to decline recently as the company moves away from the "Name Your Own Price" brand. In its most recent quarter, U.S. bookings fell 2.5%. While retail room nights and rental car days have grown, its Name Your Own Price service has declined, and lower airfares have negatively affected gross bookings, though they do not affect gross profits. In the fourth quarter, management projects the loss to get steeper, falling 5-10%. The slide also comes as Expedia Inc (NASDAQ:EXPE) has stepped up its position in the U.S. with its recent acquisition of Orbitz, growing organic U.S. room nights 25% in the quarter. 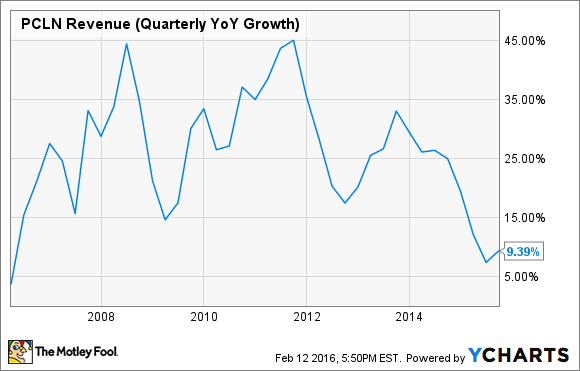 While Priceline's growth may be slowing, its profitability continues to improve. Priceline charges 12-15% commission for its listings, which supports a wide profit margin. Priceline benefits from its strong brands, and can charge a premium because of its network effects. As each site gets more popular, the desirability to list with it increases. 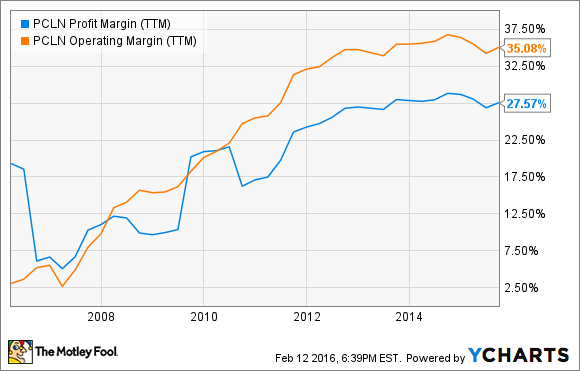 In its most recent quarter, Priceline posted an operating margin of 35%, and a net profit margin of 27.6%. That puts it well ahead of rivals TripAdvisor (NASDAQ:TRIP) and Expedia, which had a profit margin of just 6%. That difference is due to Priceline's extensive use of the agency model, meaning it acts as an intermediary between buyers and sellers, as opposed to the merchant model employed by Expedia, which buys inventory and then sells it. The merchant model drives greater revenue, but the agency model is easier for partner businesses to use and more profitable on a margin basis. Looking forward, Priceline has been warning about slowing growth rates for several years, and analysts expect growth in the industry to decelerate as it reaches maturity. However, with its reach into international markets and knack for acquisitions, Priceline may have more growth than the market gives it credit for. Last year, the company increased its stake in Ctrip.com (NASDAQ:CTRP), which operates in China, a market that saw growth double last year, so there are clearly still growth opportunities. With its portfolio of brand-name sites and track record of growth, expect Priceline to continue leading the online travel industry despite any headwinds that arise.